At a time when heritage budgets are being stretched and competition for grants and awards is fierce, crowdfunding provides an additional alternative way of obtaining support for cataloguing and digitising your collections. At Stirling University Archives, between November 2016 and January 2017 we were able to raise £8100 via crowdfunding over just 56 days to fund the cataloguing and digitisation of our Peter Mackay Archive. This shows what a powerful tool it can be. Video above: The video clip above gives some context about the Peter Mackay Archive and our project to digitise it. 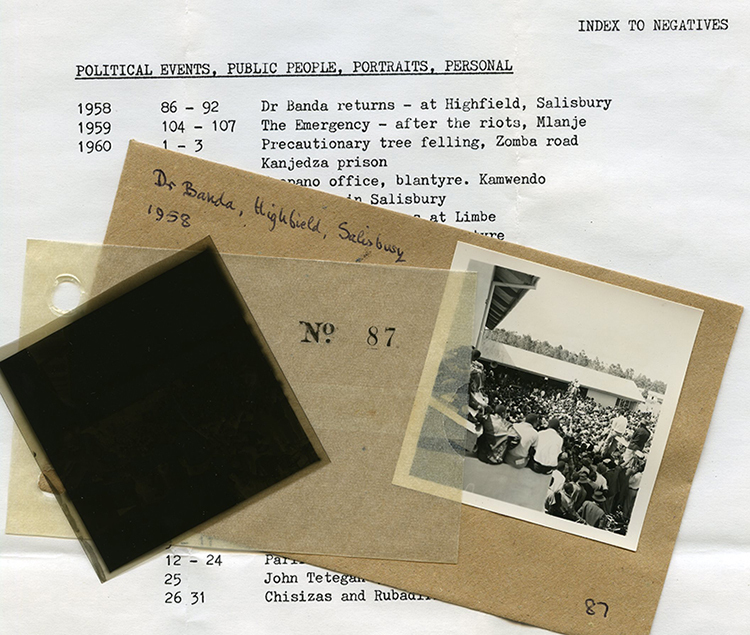 For others considering launching a crowdfunding initiative to support a digitisation project of their own, I have shared some insights and advice from our experience with The Peter Mackay Archive project below. Crowdfunding is a way to raise money, awareness and support for a project from people online. Crowdfunding platforms (such as Kickstarter, Crowdfunder, and Fundable) provide a funding page for you to describe your organisation, your project, its goals, and your funding target. The platforms then allow anyone to pledge funds to support your project by clicking a button on your funding page – with payment taken via an online payment service. As you can imagine, crowdfunding offers the opportunity to raise support for projects from a broad and diverse audience. It does require a considerable investment of time and effort, and is not without its risks, but it can provide you with the funding you need to digitise and open up your collections. At Stirling we developed our project in partnership with the University’s fundraising team. Being able to draw on their knowledge and experience was invaluable when it came to choosing the right platform for our crowdfunding project. While all the platforms out there operate on a similar basis it is worth checking the small details that can make all the difference to your project. Our fundraising team identified Crowdfunder UK as being the most popular platform for the charity and university sectors. The recent announcement by the Heritage Lottery Fund of a new partnership programme with Crowdfunder helped us to make our choice. This new programme provides match funding from HLF for up to 25% of total costs for specially selected Crowdfunder projects, to enable them to reach their targets. 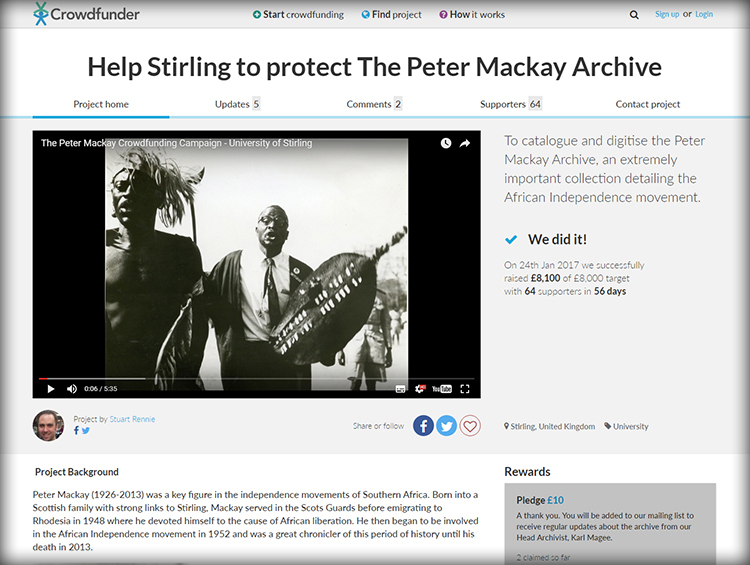 Below image: Screenshot of The Peter Mackay Archive campaign’s Crowdfunder page. Not every collection you hold will be suited to a crowdfunding campaign. One of the key advantages of crowdfunding is its potential reach. By using social media you can spread the word about your project far and wide, identifying and connecting with communities of interest around the world. Choose a collection with broad international appeal – a collection with an interesting back story, a connection to a major anniversary or event, or any hooks to generate interest! When designing the project for which you are seeking funding you should keep in mind the need to show supporters a return for their contributions. Your project should include work that makes a visible difference to your collection, something you can promote and share further down the line to demonstrate value. Remember the fundraising phase is only the beginning of your relationship with your supporters. In November 2016 we launched our Peter Mackay Archive project on Crowdfunder UK; setting ourselves the target of raising £8,000 by the 24 January 2017. Peter Mackay (1926-2013) was a key figure in the independence movements of Southern Rhodesia (Zimbabwe) and Nyasaland (Malawi). Born into a Scottish family with strong links to Doune, near Stirling, Mackay served in the Scots Guards before emigrating to Southern Rhodesia in 1948, where he devoted himself to the cause of African liberation. Following the establishment of majority rule in Zimbabwe, he took up the cause of the impoverished people of Omay on the shores of Lake Kariba. His volume of memoirs, We Have Tomorrow: Stirrings in Africa, 1959-1967 provides remarkable insights into Southern African nationalism in its most principled phase. Our fundraising campaign had digitisation at its core. The Mackay Archive is a major new research resource for all students of African history and politics. We sought support for a programme of digitisation which would provide online access to the unique resources contained in the archive, opening the collection up to researchers around the world. Our extensive use of social media, Twitter in particular, helped us to connect with the various groups around the world with an interest in supporting the digitisation of the collection. The University’s fundraising team utilised its existing supporters’ network, reaching out to our alumni. The University Archives used its Twitter account to identify and connect with organisations and groups who supported the project by promoting our campaign to their followers. Identifying and using key hashtags in your tweets is an effective way of ensuring further visibility for your messages, among the right audience. Targeting hashtags like #AfricanHistory, #Zimbabwe and #Malawi ensured our publicity was reaching interested audiences. Let the cataloguing and digitisation begin! Following an effective promotional campaign across various media platforms we surpassed our target – raising £8,100 of our £8,000 goal total with 64 supporters in 56 days. We have now begun our project to catalogue and digitise the Archive. You can keep up to date with our progress on our dedicated Peter Mackay Archive page.